Arion products were being manufactured and sold by Prince Tsushinkogyo Ltd. I joined Prince in 1973 and took on the responsibility of thedevelopment, design, and production of Arion-brand amplifiers, tuners, and effects pedals, primarily for export to the US. 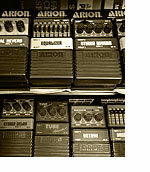 In 1986, Ueno Kaihatsu Center Ltd. was established, and after setting up a plant in Taiwan, began production of effects pedals under the brand name of Rock Tek, and then in 1996, we took up the Arion brand from Prince Tsushinkogyo Ltd., and now produce the products in Sri Lanka. © 2013 Ueno Kaihatsu Center Ltd. All Rights Reserved.